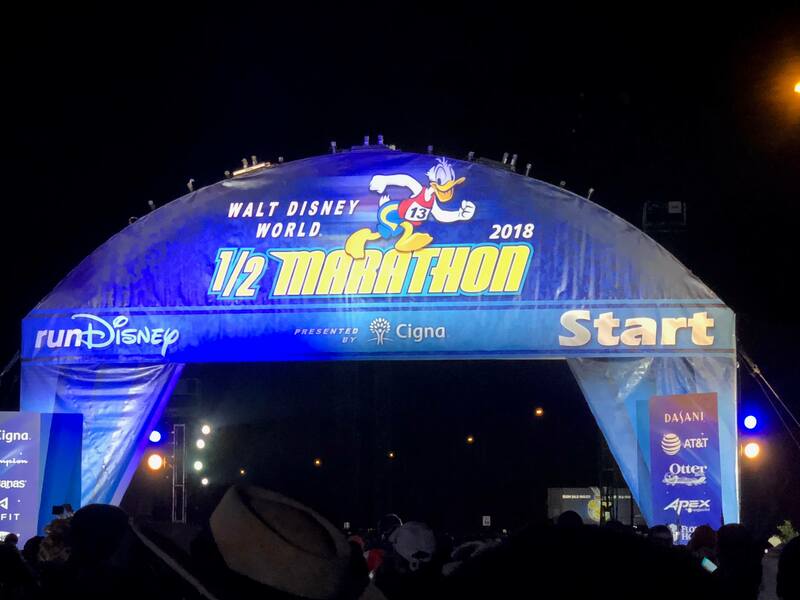 The decision was made around mile 22 of the 2017 Disney World Marathon to signup for the 2018 Marathon. I didn’t want the race to end. 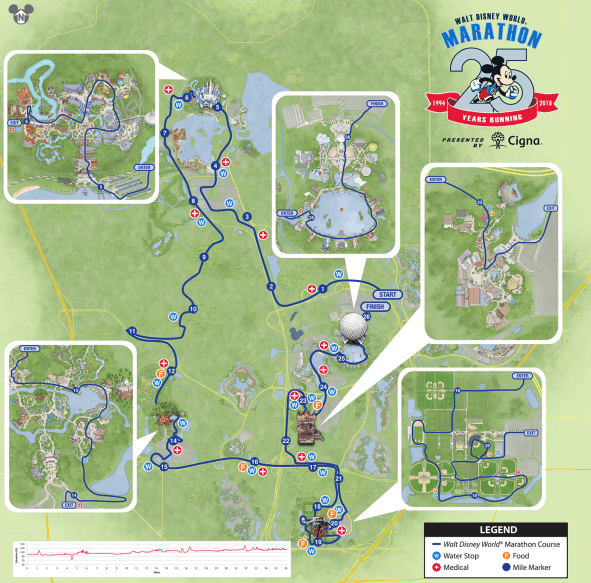 The Disney World Marathon is such an exciting and well supported dedicated marathon. 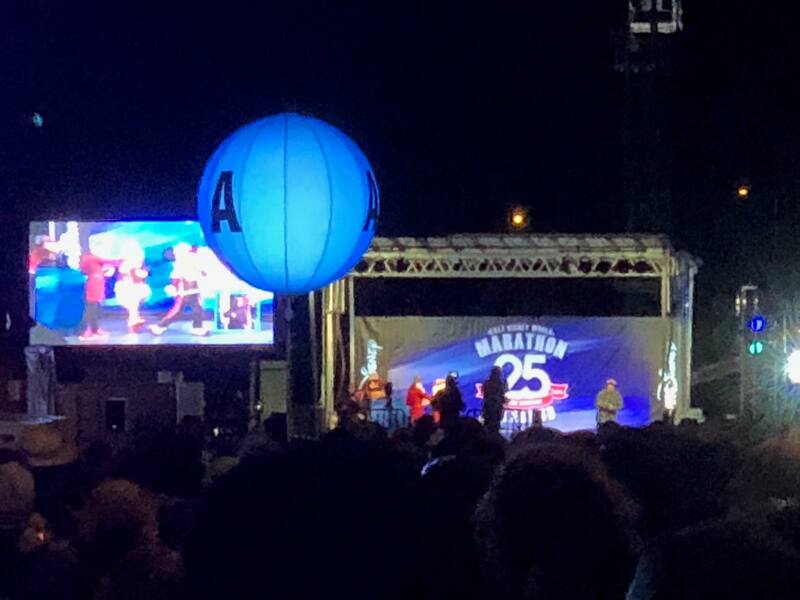 And besides, 2018 was the 25th Anniversary of the Marathon! The half marathon had been cancelled the day before and my wife was disappointed that she didn’t get to complete the “official” race. 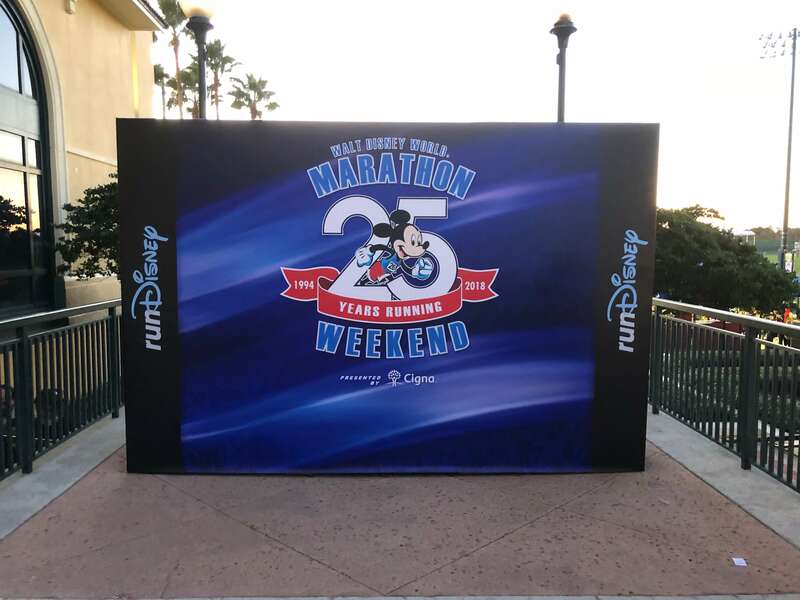 [Read more about the Walt Disney World 20th Anniversary Half Marathon] I was registered to run the Goofy Challenge (both the half and full marathons, 39.3 miles). Aside from the races, our Disney World Annual Passes weren’t set to expire until 2 weeks after the Marathon Weekend. Signing up for the race was a very easy decision. 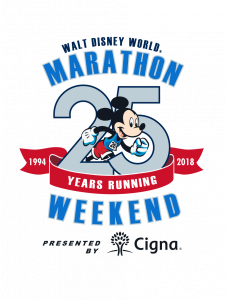 For the 2018 weekend, I registered for my 2nd Dopey Challenge – 5k, 10k, half marathon, and the full marathon. 48.6 miles over 4 days of races. 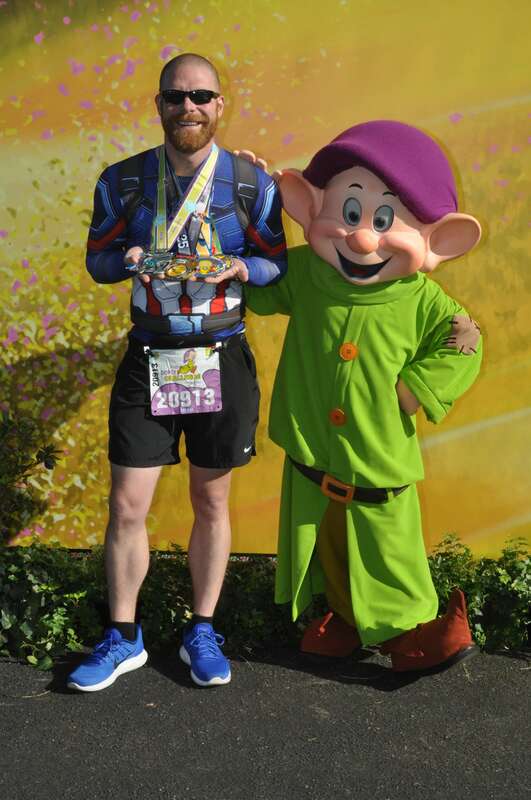 I completed my first Dopey Challenge in 2015. My early planning had the these races listed at Priority C on my schedule. The idea was to go out and have fun and enjoy the weekend before kicking off training for the 2018 IRONMAN Louisville. 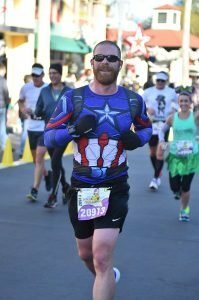 Not running a marathon in the fall of 2017 for the first time in 4 years left me with a void and some unresolved goals for my 37 Before 37 Goals list. Training was going incredibly well as both my endurance and pace improved dramatically in this training period. 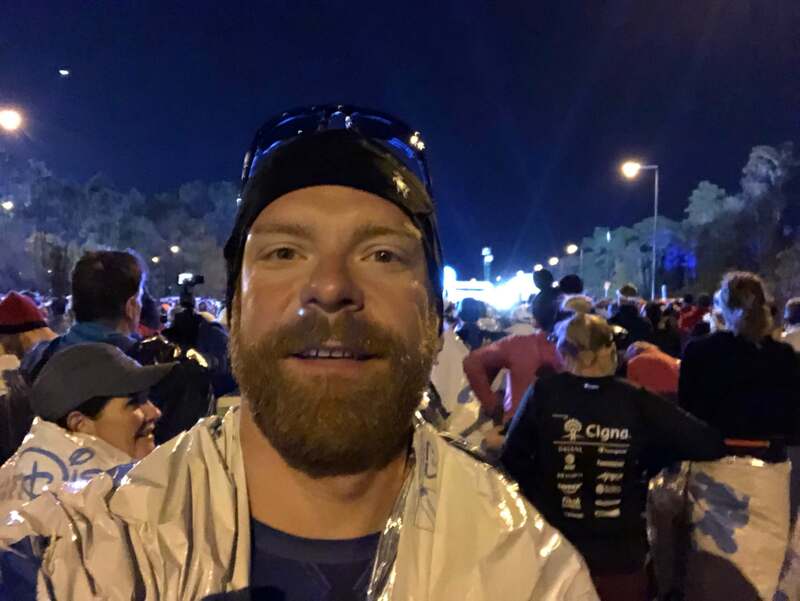 I realized quickly that I had an opportunity to turn the marathon into an A race and could very well hit my goal for my first sub-4 hour marathon. My training plan was solid, health was good, and spirits were high going into the holidays and the Marathon Weekend. 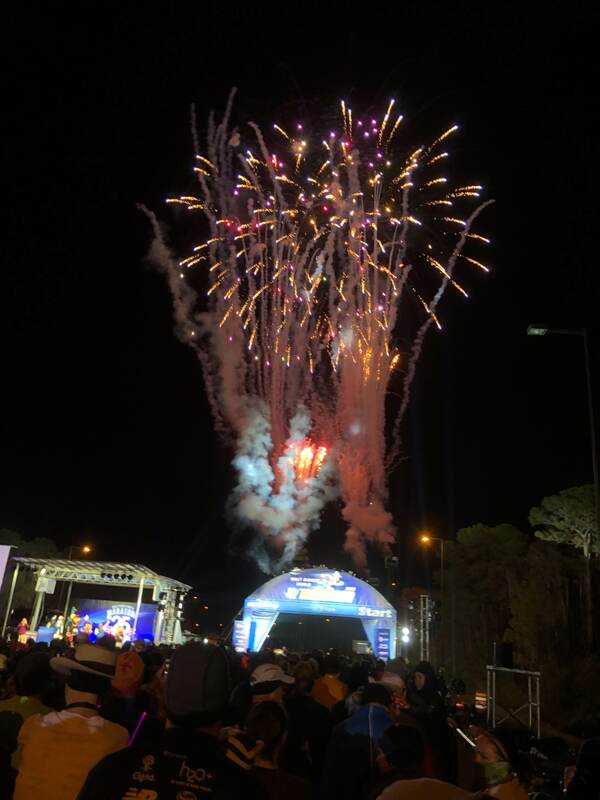 I had hoped for mild temperatures through the marathon to help me achieve my goals with a warmup the following days to relax and celebrate. The weather forecast was looking favorable. This year, I had some close friends and family also participating in the race weekend. My sister-in-law, Beth, was running the 10k, my wife, Terri, was set to run the half marathon, and my friends Stuart and Cate were running the full marathon. As an early Christmas and Birthday present, Terri and I got Stuart a bib for the marathon, which conveniently fell right at the beginning of their family vacation and on his birthday week. Cate was running with her friend, Jamie, who was participating in her very first marathon. It’s always exciting to have friends and family running races with you. However, going into the weekend I was not only worried about my own performance for the weekend, but their performances as well. My biggest concern was that one of us would have a bad day and that it could ruin the vacation or any celebrations for the week. Aside from Cate who is a very seasoned runner, everyone else had struggled with injuries through training or struggled to find time to get workouts in. 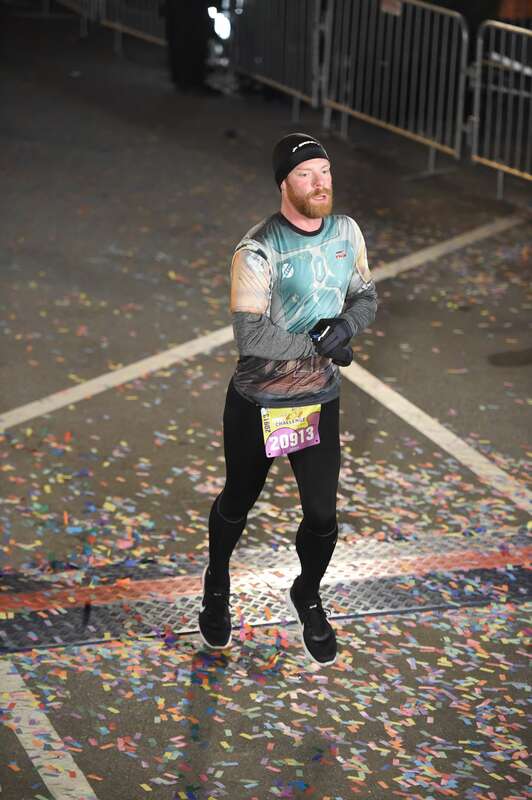 Although Stuart is also a seasoned runner, he was only able to make it to a max of 15 miles in his training due to injury and hadn’t run a full marathon in a few years. Beth had struggled with a back injury and only made it to 3 miles of training for her 10k. Scheduling and life got in Terri’s way and her last few long runs were cut short or skipped. Fortunately, everyone was feeling great going into the marathon weekend and spirits were high for the Walt Disney World Marathon 25th Anniversary Weekend! The expo this year was a bit chaotic. Pulling in to the ESPN Wide World of Sports Complex was a bit slow due to heavy traffic. Bib pickups, official merchandise, and other merchants were scattered throughout different buildings. Later it was revealed that the expo was supposed to be completely hosted in the new arena, but construction was a few weeks behind so they had to change plans late into preparing for the expo causing a bit of the unorganized feel. 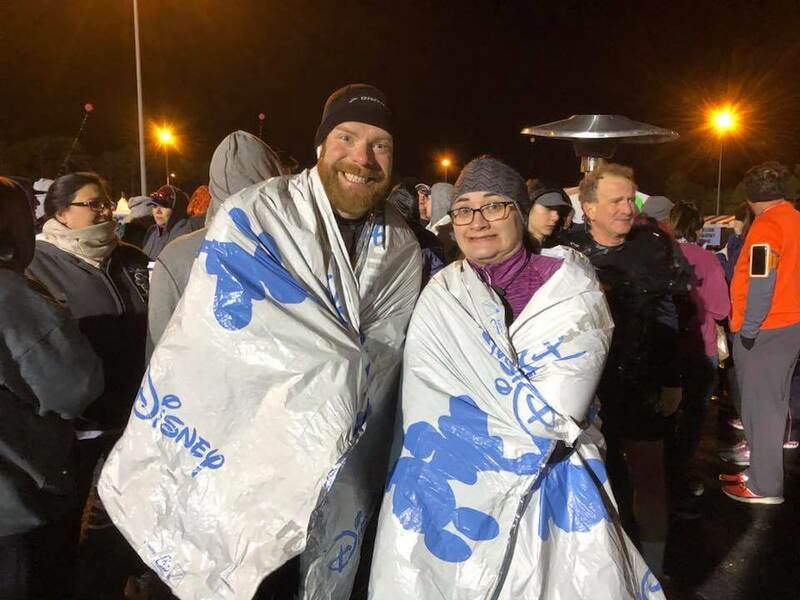 The lines for the RunDisney Official Merchandise were incredibly long and guests were queued in a winding line outside in the cold temperatures. Little did we realize that these cold temperatures were nothing compared to what was coming over the next few days. Tons of people were packed in a huge space full of official swag. I spent nearly 3 hours at the expo and didn’t even have time to look at the other merchants before my dinner reservations. 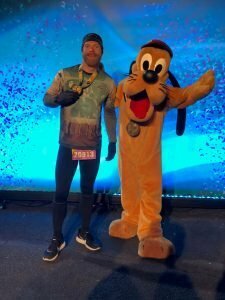 I made the trek to Epcot on my own for the 5k. It was the only day I didn’t have any other friends running the race with me. Temperatures were a bit more cold than mild as it had dropped to 32°F with a slight cold breeze out of the north. The RunDisney event staff released a temperature warning the day before. For some reason, 32°F always feels colder to me in Florida than it does at home. I didn’t have any real goals for the 5k. The plan was to use it as a warmup run for the rest of the weekend and only to stop for pictures with select characters with short lines. Temperatures were good and the race course is short and fast. So, naturally, I went out a little too hot and had to convince myself to slow down. There were no plans for a PR on the 5k race, only the marathon. The 5k race only offered a few common character stops. Definitely not worth slowing down for. Running into Epcot’s World Showcase from the backlot really sparked my excitement and reminded me of the excitement of Disney races. In the end, I finished in 22:30 with an 7:02 pace. The 5k is only timed for Dopey Challenge participants, so no official race statistics are posted beside finish time. The 3:00am alarm on the morning of the 10k came quickly. My sister-in-law, Beth, also ran the 10k that morning. Unfortunately, we didn’t move very quickly and I was walking to the start corral area as they were already moving the B corral. So, I was forced to skip my port-a-potty stop and I had to weave my way through to get to the front to start with the A corral. Again, I didn’t have any solid goals for the race. 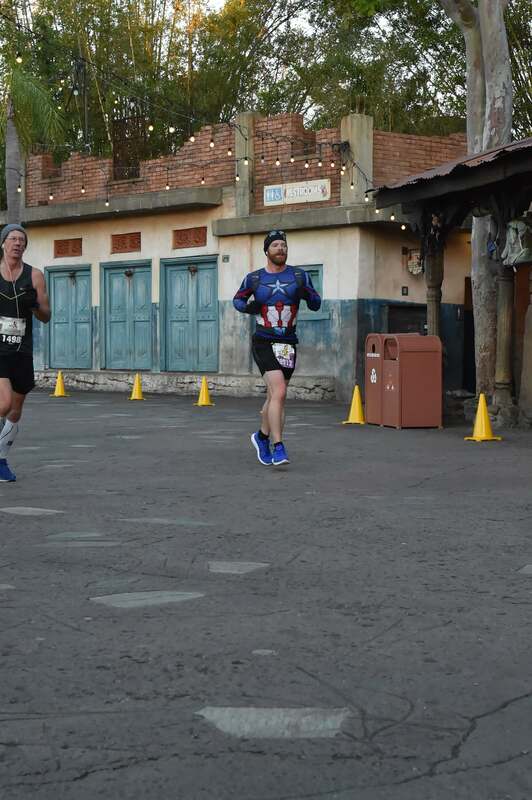 The plan was to follow the same thinking as the 5k – run it out, stop only for select characters with short lines, and stay loose for the marathon. Temperatures that morning were colder than the day before, dipping to 27°F and the breeze continued from the north, but were a bit stronger than the day before. It was noticeably colder than on Thursday for the 5k. 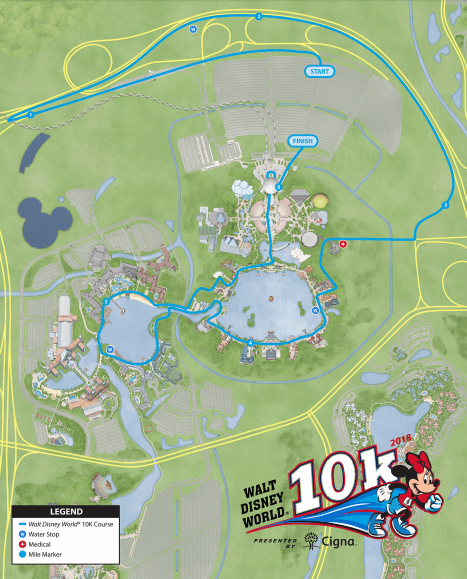 I am a big fan of the 10k course. It’s the only one of the races that runs across the full Boardwalk, near the Boardwalk Resort. Genie was waiting with no line outside of the ESPN Club. Naturally, this required a photo. In the end, I finished at 47:38 at a 7:40 pace. This was nearly 10 minutes faster than my previous personal best for a 10k! I was very pleased overall with my performance with two days of races in a row with negative splits. Also, I was very pleased that I placed 264th overall out of 12,894 finishers. 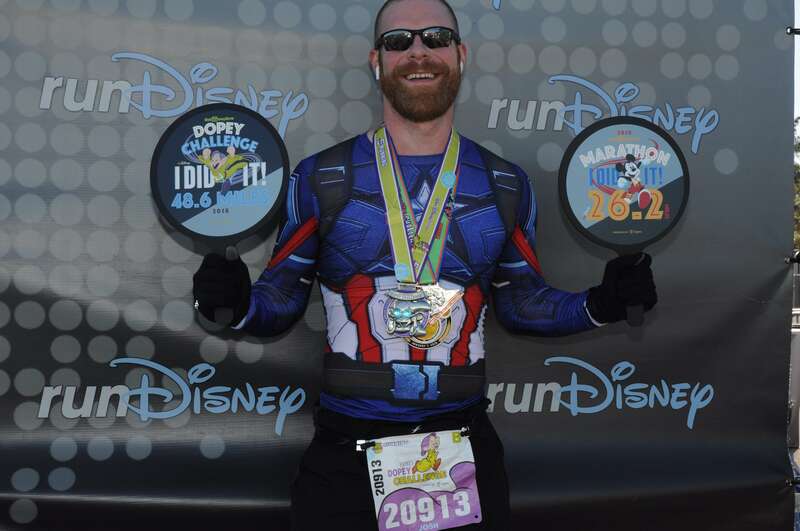 Looking through my past races, I realized that the only 10k races I have ever run are RunDisney events at Disney World and Disneyland. No surprise that this was easy to achieve a PR as I didn’t stop for many characters and ran straight through for the race. While waiting for Beth to finish, I acquired pictures with Minnie and Dopey. 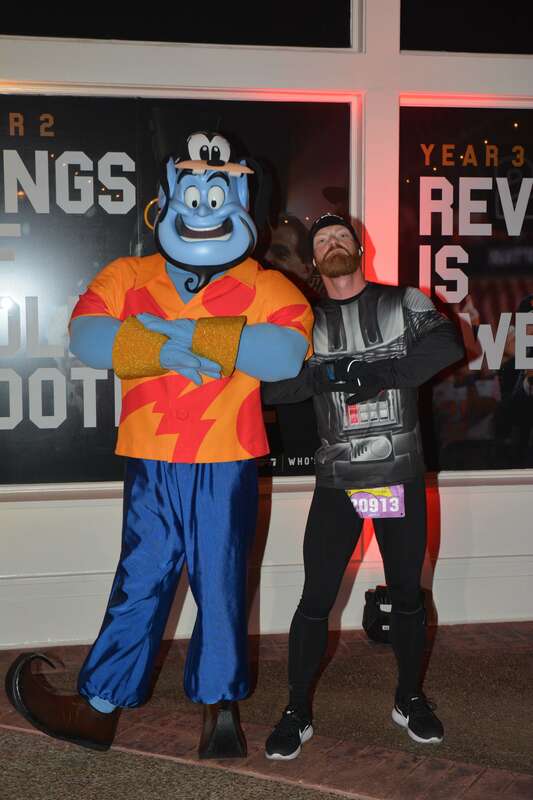 The nice part of finishing the races early meant shorter lines for character pictures at the end. Unfortunately, I didn’t make it back to the finish line in time to see Beth complete her first 10k. She was quite happy with he result, especially due to injuries during training that allowed her to only train up through about 3 miles. Always great to have us both happy with our results so we could have a celebration! Unfortunately my celebration had to be low key with 2 more days and 39.3 miles of races to complete. So, I splurged and had an extra glass of wine at dinner! The Half Marathon day’s plan was to pull back on the throttle and keep it easy. I wanted to run this relatively straight through to save my legs for Sunday’s marathon. However, I couldn’t get it out of my head that I could easily run the race out and hit my sub-1:45 half marathon goal. I had to keep talking myself out of reaching this goal. I had to save the gas for the marathon. 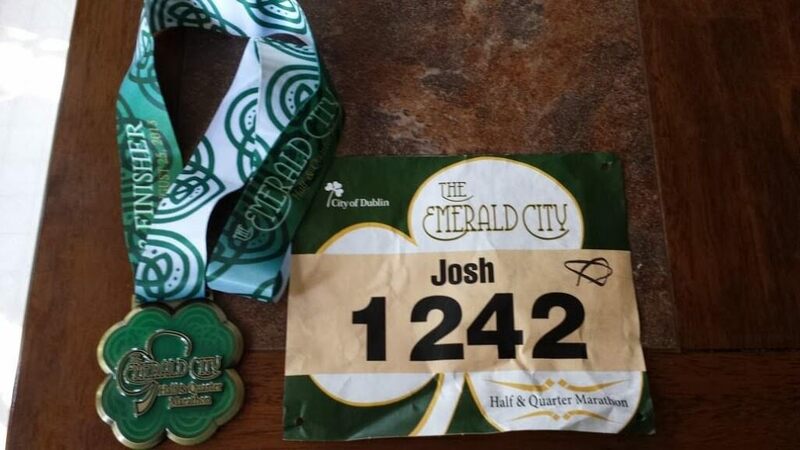 Sunday’s marathon was my best and likely last opportunity to hit the sub-4 this birth year. My wife, Terri, ran the half marathon as well. Her goal for the day was simple: Stop for as many character pictures as possible without getting swept. Once again, it was pretty cold outside – starting temperature that morning was closer to 35°F. The breeze was a bit chilly, but the mylar blankets definitely were helping. We walked the mile down the service road, shivering, to the half and full marathon starting corral area on Epcot Center Drive. For the half marathon and full marathon I was assigned to B Corral. She was starting in a back corral and wasn’t expected to start for about an hour after my corral. Once again, I arrived very close to the starting time and had to skip the port-a-potty stop to prepare to run. Overall, my body was feeling very good and well rested before the start. I had to keep reminding myself that it wasn’t the day for a big PR. I started out slow, pacing about 8:50 miles. Although within 2 miles, I kicked up the pace to about 8 minute miles. 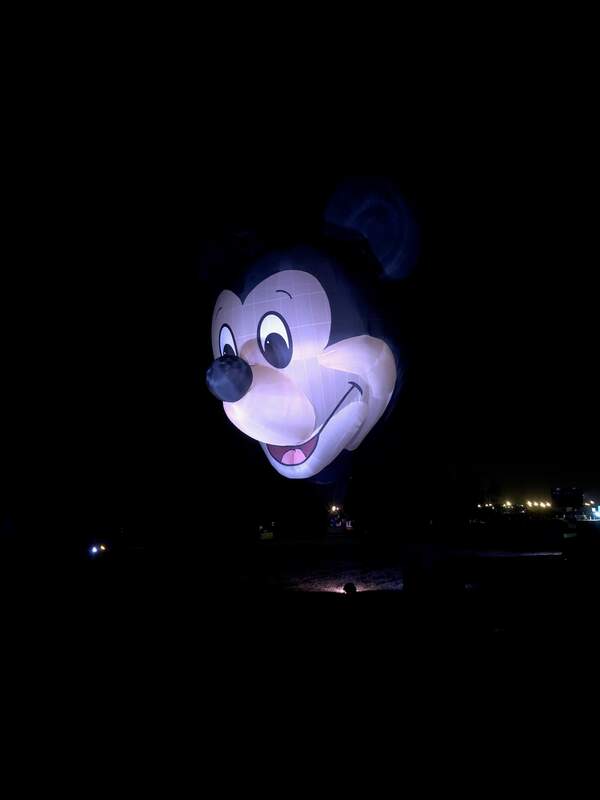 On the way in to the Magic Kingdom gates, there was a hot air balloon of Mickey Mouse. I couldn’t help but stop for a picture. It stood out very well in the dark. Aside from the hot air balloon, the characters on the course were relatively common and expected. I made a few stops for characters, like Genie from Aladdin, when there were no lines or they were very short. As I passed through the Ticket and Transportation Center and in to the gates of the Magic Kingdom, I was feeling great. I kept an even pace through the park. I decided to pickup the pace a bit when I left the Magic Kingdom on the way back to Epcot. I started working between 7:30 and 7:45 pace for the majority of the 2nd half of the race. As I approached the 10 mile mark, the realization that I was very close to hitting the sub-1:45 goal without even trying hard. I decided to give it a go as I was still feeling very good and comfortable. At mile 12, it was clear just how close I was to this half marathon goal, but needed to pickup the pace if I wanted to hit it. I knew I might regret it if I jeopardized my marathon goal, but I pushed it hard anyway through that last 1.1 miles and rolled through the finish at a 6:26 pace. In the end, I missed the sub-1:45 goal. I finished in EXACTLY 1:45:00. Making those character stops and not pushing it up a little earlier was mildly frustrating. Knowing that I have other opportunities to push for this goal over the next few months made this easier to deal with. Besides, it was still a 10 second personal best. Two days of PRs. Three days of great races and negative splits. I couldn’t have been happier. While waiting for pictures, the worry hit me again that I might have jeopardized by sub-4 hour marathon by pushing to hard at the end today. I hoped that I hadn’t tired my legs to much. I struggled with this rattling around my head all day. Terri finished her race and was very happy. She was able to stop for many pictures and had a great outing. Once again, another opportunity to celebrate! Which really meant I was going to have a desert and extra glass of wine at dinner, then be in bed by 9pm. After 3 days of statistically great races (2 of which resulted in personal best times), I couldn’t help but fear that I didn’t have enough gas left in the tank to hit my big goal for the sub-4 hour marathon. I put myself in overdrive those last few miles at the Half Marathon, over pushing at what was supposed to be an easy race. I continuously reminded myself that I had trained for this and that I was capable of meeting these goals, but doubt still raced through my mind. Marathon morning was a bit stressful. I woke up starting to feel the effects of the prior 3 days of racing and was feeling uneasy about my plans for the race. On top of my physical condition, I was struggling to decide if I should wear tights or shorts with temperatures hovering just about 40°F. It had been so cold the previous days and I was sick of freezing before the races. In the end, I opted to go forward as originally planned with my racing shorts and new Captain America long sleeve shirt. The bus ride was a bit slow on the morning of the half marathon. So, I left my hotel room about 15 minutes earlier hoping to get to the races early enough to meet up with my friends Stuart and Cate who were also running the Marathon. Unfortunately, it took 45 minutes for our bus driver to make the mile and a half drive to Epcot. The heat on the bus was cranked and all of us runners were stripping layers, trying not to sweat to death before going back out to the cold. The bus finally dropped the runners from my resort off after nearly an hour. 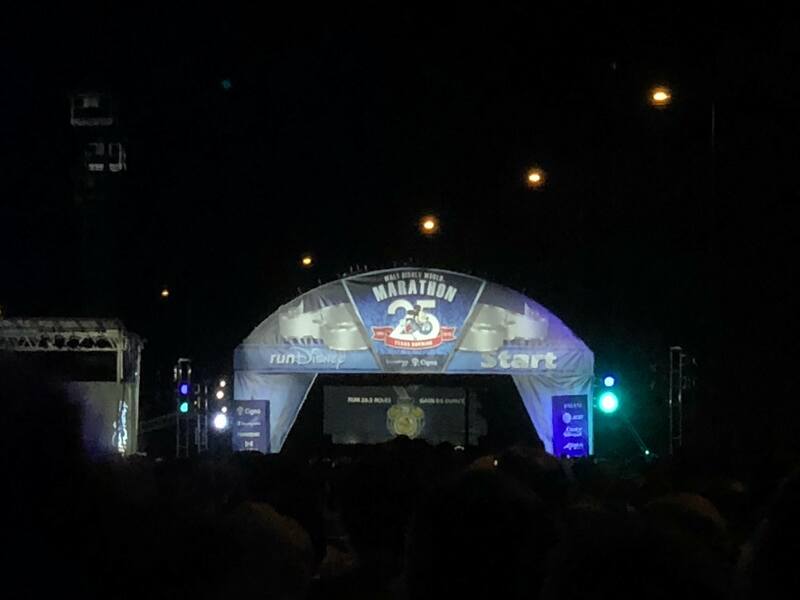 I arrived just in time to meet up with my friends and we made our way to the corrals. 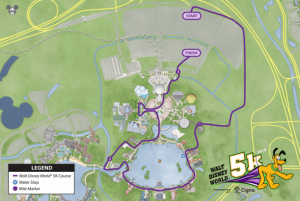 Another mile walk down the service road to the starting area on Epcot Center Drive. Stuart, Cate, and Jamie decided to start the race together and they headed off to their starting corral and I headed to mine. I made it to my corral in plenty of time to take a few pictures and get prepped for the run. Mentally, I was in a good place. I was a little nervous about my physical condition, but it wasn’t any worse than what I had trained through. 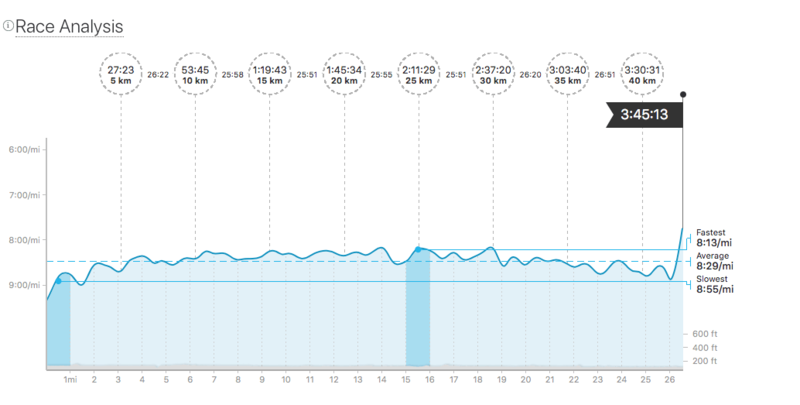 The plan for the day was to work hard for 26.2 miles of negative or at least even splits. 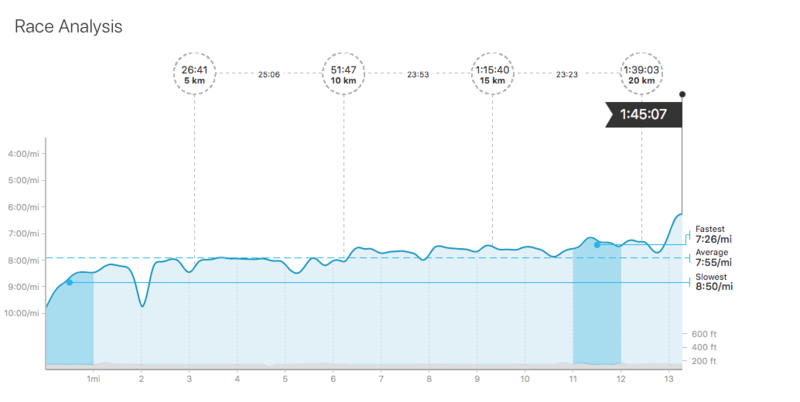 I planned to start slow and keep my first 10 miles at about a 9:15-9:30 pace. I just hoped that I had the gas to make it the full 26.2 miles at an average of a 9 minute pace. Confidence in achieving my first sub-4 hour marathon was still relatively high. 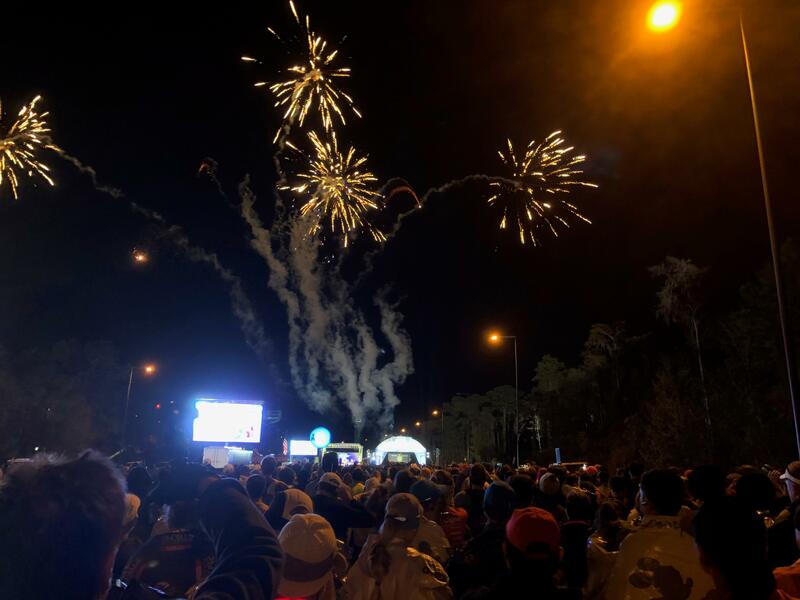 The excitement of the race start (complete with fireworks and entertainment) and a corral full of speedy runners had me starting out a little faster than I wanted. 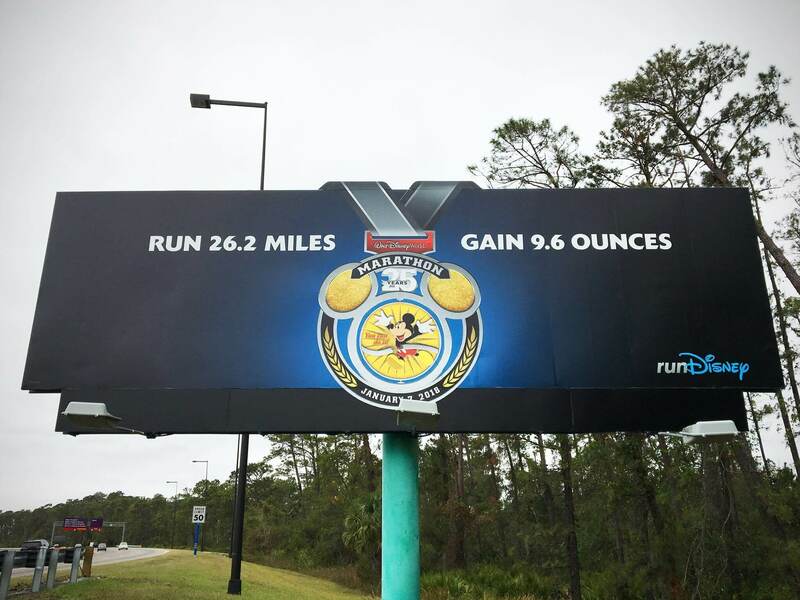 A billboard just past the starting line had a picture of the marathon medal and read “Run 26.2 Miles. Gain 9.6 Ounces.” I couldn’t wait to get my hands on the hardware. Just ahead of the sign, there was a high school marching band cheering and playing. Near the first turn, there was loud Disney music playing. The energy was very high in the first mile and my pace was a bit faster than planned, but hovering just below 9 minute miles. 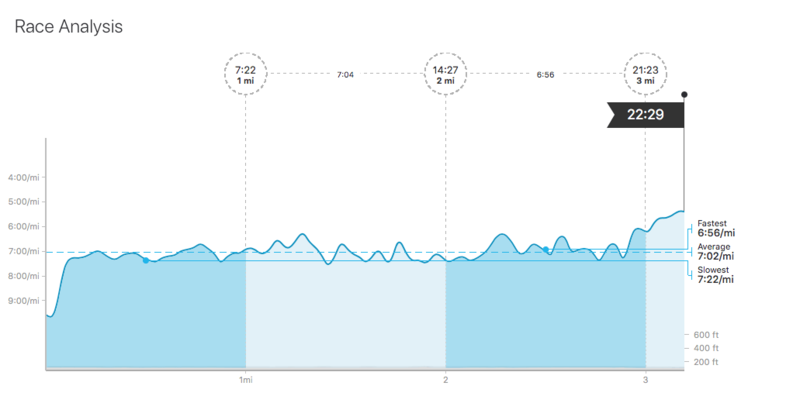 After gauging my overall condition and feeling good, I picked up the pace a bit at mile 3. I was concerned that I might hit the wall about mile 20 and was hoping that picking it up a little earlier might pay off at the end. I pushed it up to about an 8:30 pace and planned to maintain that for a while. 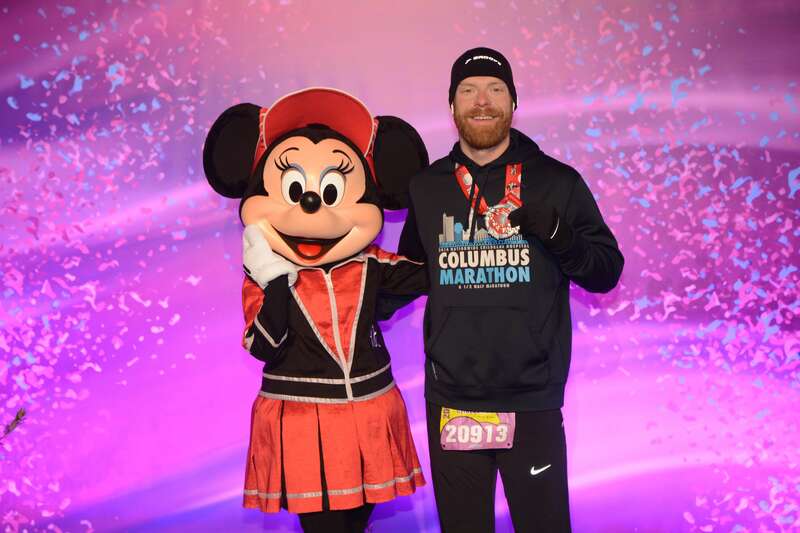 The energy along the race course was incredible and naturally pushed me to run a few miles a little fast and closer to 8:15’s, but I pulled it back and continued to maintain an 8:30 pace. The early character stops had long lines and I knew I couldn’t stop for them. Launchpad McQuack was out with Scrooge on the way to the Ticket and Transportation Center, but the line was way too long to stop. I was very disappointed as this was one character stop I had consciously said I would make an exception for, but it would have set me back over 5 minutes and was concerned how the stopping and restarting for photos would effect me later in the race. Cheering spectators lined the course through the Ticket and Transportation Center and again from the gates of the Magic Kingdom through Main Street to Cinderella’s Castle. The energy was very high. 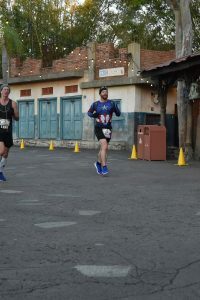 Being a Disney Addict, running through the parks gives me the opportunity to blend my love of running and Disney together. My emotions were high. I passed by my wife, just before making it to the caste gardens. As I made it to Tomorrow land, I ran though a personal status check, realizing that I was running faster than I should be again. I reset myself with a photo op in front of the castle, and made my way through Frontier Land and out of the park. 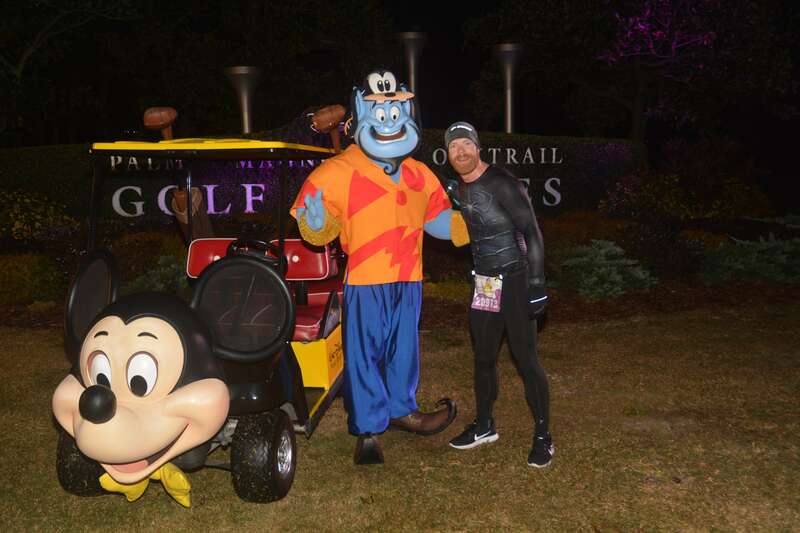 The run on the service roads out of the Magic Kingdom and down to the golf courses was smooth and steady. It was very dark through this section of the course. Although they had DJs and music playing on this stretch, I decided to turn on my own music and shuffled my entire playlist looking for random high energy music. As the sun was coming up, the course made its way through a service area where they had signs out describing how Disney recycles and uses different techniques for handling water and electricity at the parks. Around the bend near a sewage treatment plant found a horribly placed water stop. The breeze was blowing the stink from plant right at the volunteers. I felt horrible for those poor people. The out and back on the course near the halfway point was another great point for me to assess my current situation. The biggest realization was that I was that I was getting hungry and I was only carrying one pack of Gatorade chews. Fortunately, before making it to the Animal Kingdom park, there was a perfectly placed “magic banana stand” that was just what I was looking for. I also recognized that I was still feeling really good. So, I decided that it was acceptable time to pick it up a notch and started to get close to an average of about 8:20 miles. At this point, I was starting to have the realization that I was on track to finish well under 4 hours if my current condition continued. As I made my way into Animal Kingdom, my brain was racing. I was already becoming overrun with emotion and needed to keep it in check. I completely overlooked running by my favorite ride, Expedition Everest. 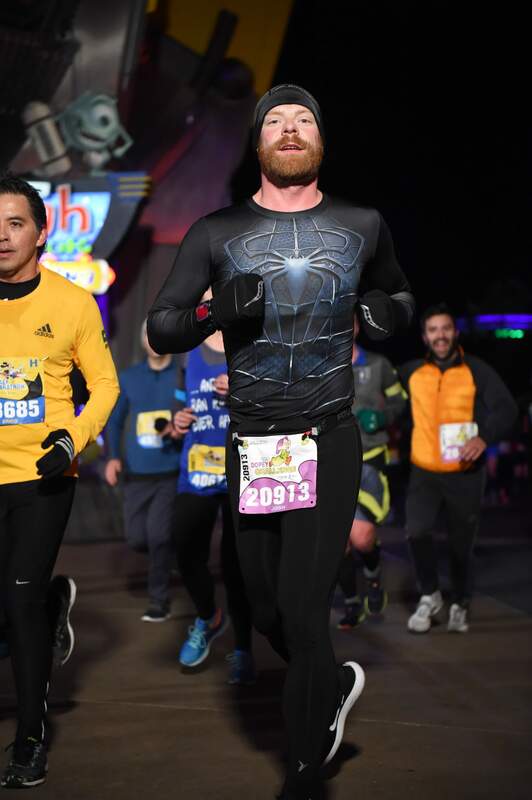 Although I am not completely sure, I believe the ride may have been running and I missed an opportunity to ride it in the middle of the marathon. Although I would have likely talked myself out of it anyways in the quest to meet my sub-4 hour goal. I was mildly disappointed that the course did not take us around the Tree of Life at Animal Kingdom. However, I was very happy that they changed the course and we didn’t have to run a big loop around the parking lot. That is a long, very boring mile. Next up was the 2 and a half mile straight away down the Osceola Parkway. This is a tough stretch of highway with a couple of big overpasses to climb. In the past marathons, there were some good characters out there, but I don’t recall any this year. I kept it easy up the hills of the overpasses and slow on the downhills. There was a fair number of spectators out along the road here, but not enough to liven up this portion of the run. Heading into the ESPN Wide World of Sports complex, I noticed many runners were starting to hit the wall. A lot of runners were starting to walk at this point. I, however, was still feeling very good and my pace was quite steady. I popped a few Gatorade chews and pressed on. 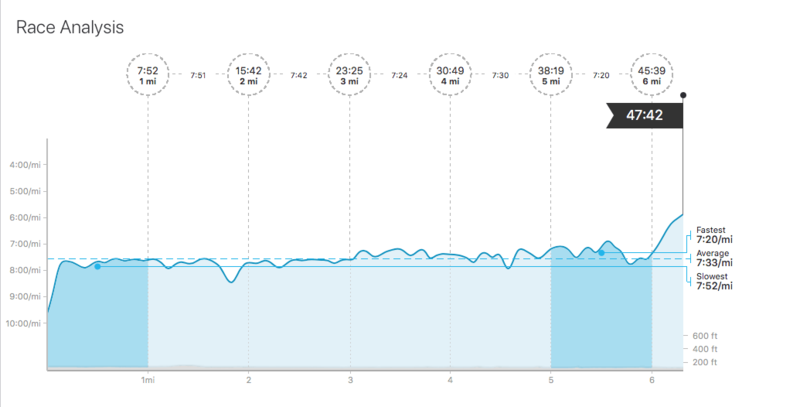 Midway through the complex, I peaked with my fastest pace of 8:13 at mile 19. Weaving through the paths at the Wide World of Sports takes runners on to the track and even a run around on the outside of the baseball field. I am always amazed at the size of Wide World of Sports and how it is 4 mile section of the marathon course. I was disappointed that they no longer played the old college fight songs on the loud speakers this year. In the past, I loved listening to the Notre Dame fight song on this part of the course. With the Braves no longer playing spring training baseball in Orlando, running the baseball field lost some excitement. However, I did enjoy the puns that lined the course on the way back out to the street and throughout the rest of the course. 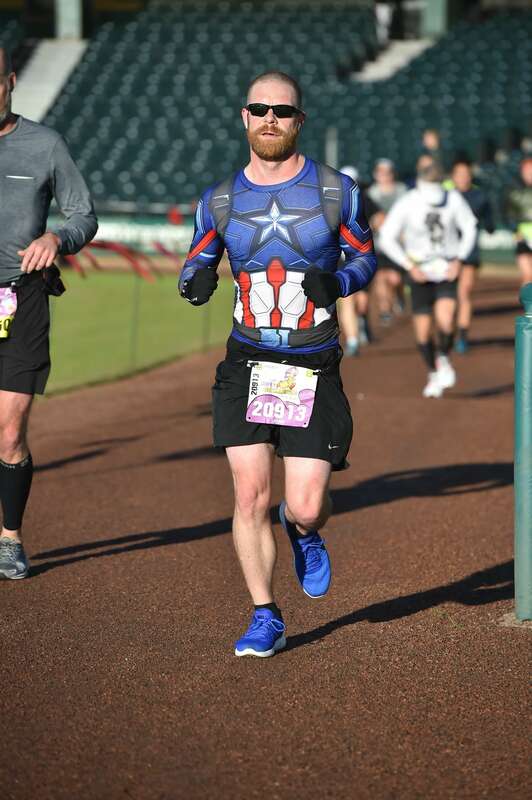 As I made my way out of the sports complex at mile 21 and back up to the Osceola Parkway, I started to become sad as I realized that the race was coming to an end. I was also starting to feel the effects of the previous 43 miles of running. Making my way up the final ramp, the emotions kicked in. Hard. I was on pace to not only break my sub-4 marathon, but I was on track to have a nearly 20 minute personal record! I was able to get my bearings back and saluted the Green Army Guy barking orders for runners to make it up the hill or to drop for push-ups. The hill took a bit out of me and pulled back a little to save some gas for the end. Hollywood Studios park was already open and at this point there were tons of people cheering on the runners. The spectator energy was at peak. On my way from Hollywood Studios to the Boardwalk, I was struggling to stay composed. Emotions were high and I knew that my daughter, Zoe, and sister-in-law, Beth were waiting along the route ahead. My legs were getting tired and I was losing focus. I threw down the last of my Gatorade chews and forced myself to press on and not slow down. The course on the far side of the Boardwalk by Yacht and Beach club resorts was lined deep with a ton of people cheering. I saw Zoe and almost broke down right there on the course. Her and Beth were loudly cheering me on as I climbed the final hill. I did my best to not look at her or I knew I would lose it. As I rounded Epcot’s World Showcase Lagoon, my Apple Watch was blowing up with text messages from my wife, daughter, and friend Brian sending me words of encouragement. I continued to toss around the disappointment that the race was nearing the end, but the excitement that I was about to crush my sub-4 hour goal by almost 15 minutes made it all worth it. I trained very hard for nearly 4 months for this. 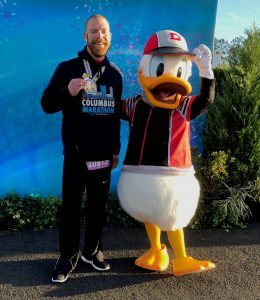 Attempting to swallow my emotion, I went ahead and stopped for a quick picture in front of Spaceship Earth and pushed hard through the Gospel Choir at mile 26. I wanted to sprint the last stretch to the finish line, but I didn’t have it in me. I glanced at the clock and quickly did the math to estimate my finishing time. I was in the 3 hour and 45 minute range. 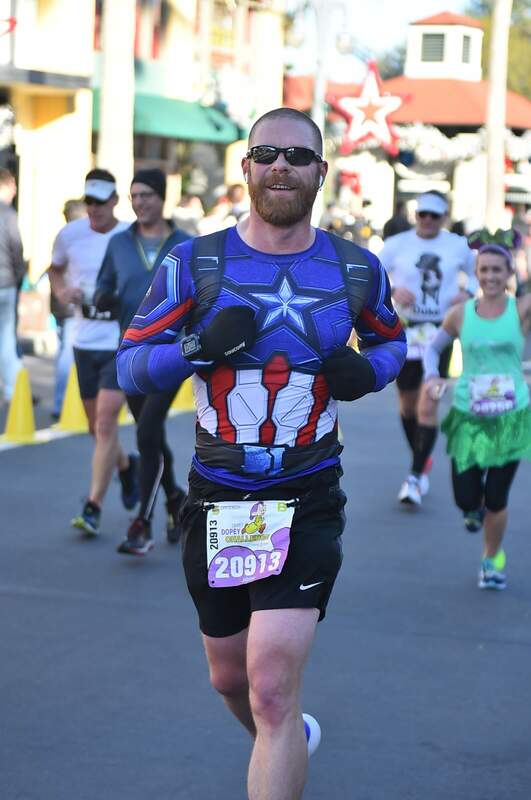 I kept my pace even and crossed the line in a whirlwind of emotion. 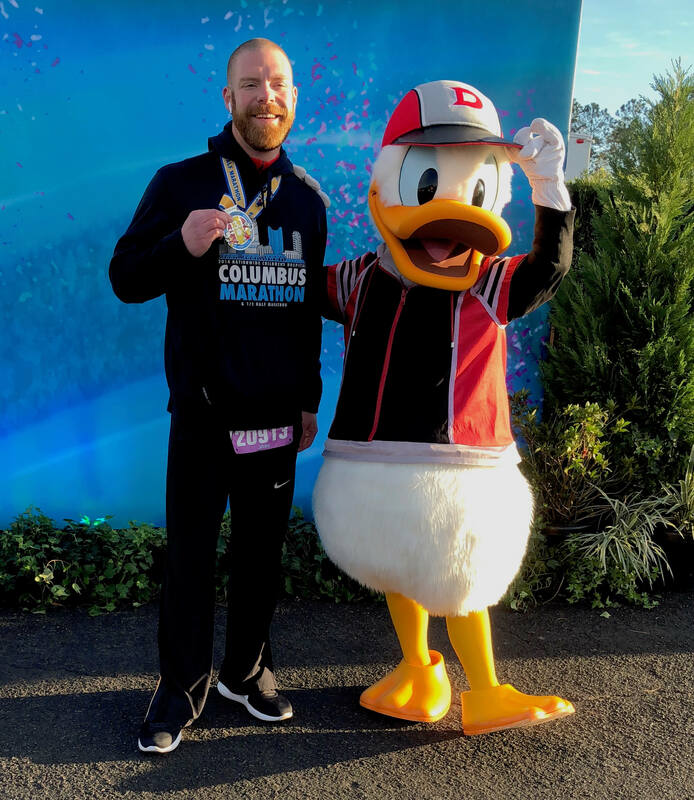 Continuing to fight back the tears, I stepped up to receive my 9.6 ounces of awesome – the 25th Anniversary Disney World Marathon medal. I slowly walked through the finishers area and looked for the first secluded corner where I sobbed like baby. A medic approached me in concern to make sure I was alright. I blubbered, “I’m good. Just a bit emotional. Big PR today.” She gave me a pat on the back, congratulated me, and I continued to push out the emotions. 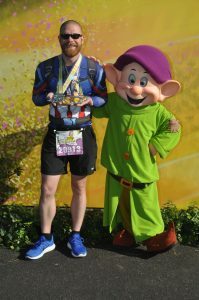 Receiving my Dopey Challenge medal was incredibly special. I worked really hard through training and was able to leave it all on the course – 4 days in a row! 48.6 miles, 3 personal records, and broke my sub-4 hour marathon goal. I was so excited and proud of the effort I put in to this. Now it was time to wait for the rest of my friends to finish and hopefully prepare for us all to celebrate. Meanwhile, I met up with my wife and acquired my other 3 medals to get pictures with Mickey and Dopey. Realizing that my friends still had a few hours until they would finish, I made my way though Epcot and back to the Boardwalk Resort of a nice long shower. My family and I made our way to same bridge that Zoe and Beth were at as I passed by in the marathon. We cheered runners on and waited patiently for Stuart, Cate, and Jamie to make it through. We realized that we had just missed Cate and Jamie, but knew Stuart wasn’t far behind them. I was excited to see him make his way down the path and in good spirits! Shortly after, my cousin, Stacey, passed by as well. 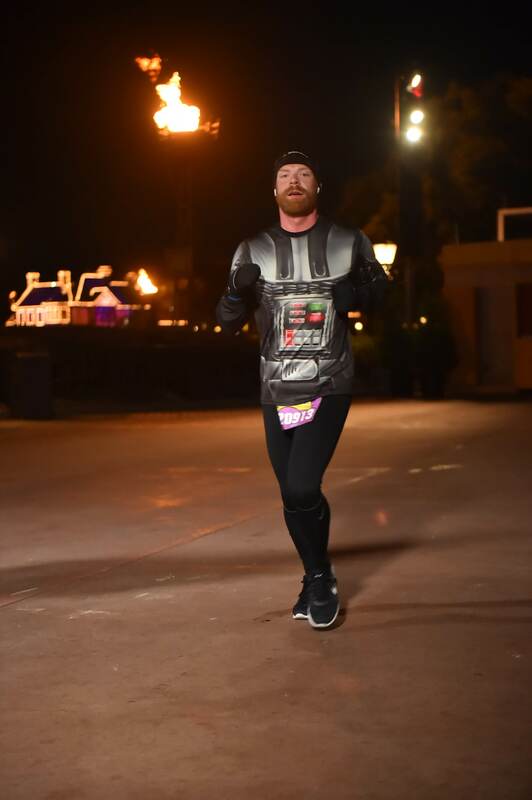 We headed to the finish line area through Epcot to congratulate the crew. After the race, everyone split up to prepare for celebrating at Epcot this afternoon. I was especially excited as we had reservations at the Rose and Crown Pub later that afternoon. By the time we walked back to Epcot again, I had realized it was already almost 2pm and I hadn’t eaten anything substantial since before the race. Nothing really sounded too good to eat, but I thought I should get something light to hold me over until dinner. We stopped at Sunshine Seasons at the Land Pavilion and I grabbed a cold Southwest Chicken Wrap and a salad. About halfway through eating, I started to feel ill. I continued to eat assuming that my stomach was just a bit uneasy from the race. By the time I had finished, I knew this wasn’t going to end well. I promptly headed back to the resort to rest. Overall, this was a very solid race. Weather and course conditions made this a very solid run. Was holding back a bit here to save energy for the next few days of the Dopey Challenge. This was a great opportunity to practice working negative splits. Official time tracking is only completed for Dopey Challenge participants and not the complete field. Therefore official data is limited. Another very good race. The cold temperatures made this feel easy. Another set of progressive negative splits. Very proud of the finishing place here. Mildly warmer, but still very cold for this race. Once again, I am very proud of the finish place and the negative splits. At this race. Was really hoping to officially hit that sub-1:45 goal, but couldn’t be happier with this performance. Especially considering it was after 2 days of races with another day to follow. Perfect marathoning temperatures. A very even pace overall for the complete 26 miles. Considering this fell after 3 previous days of racing, I was very pleased. I am looking forward to my next “A” marathon to see what I can do when I am focused. 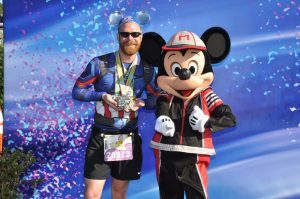 Although I didn’t get to celebrate an incredible Dopey Challenge at the Walt Disney World 25th Anniversary Weekend, I still couldn’t be happier with those 4 days of racing. I’m left to think about how well I would have done if they weren’t back-to-back races. I will have plenty of opportunities for that. 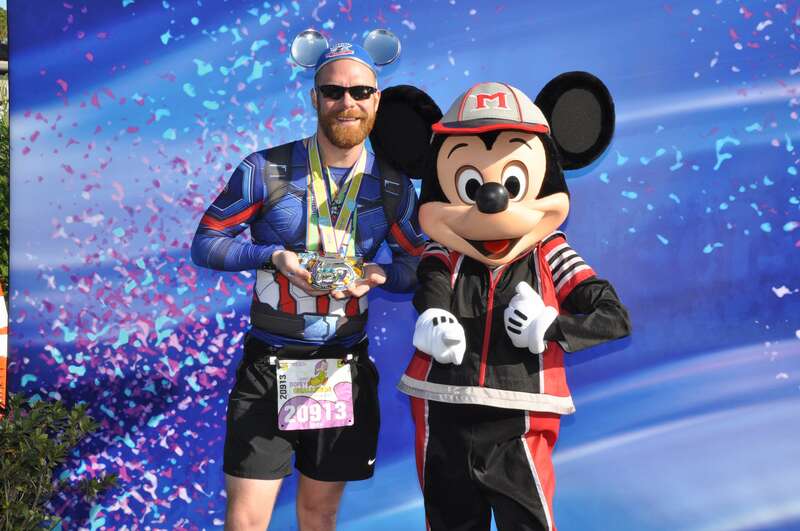 The Disney World Marathon will always be one of my favorite races. 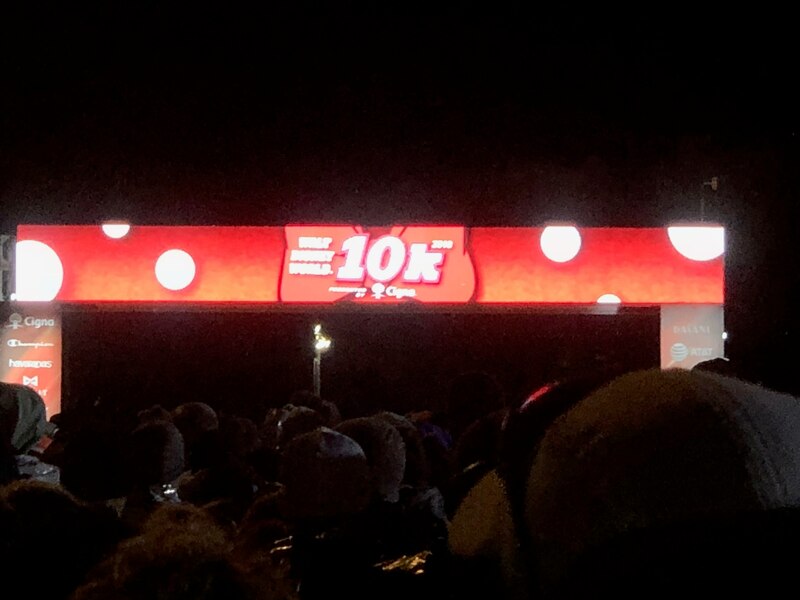 RunDisney events are incredible. 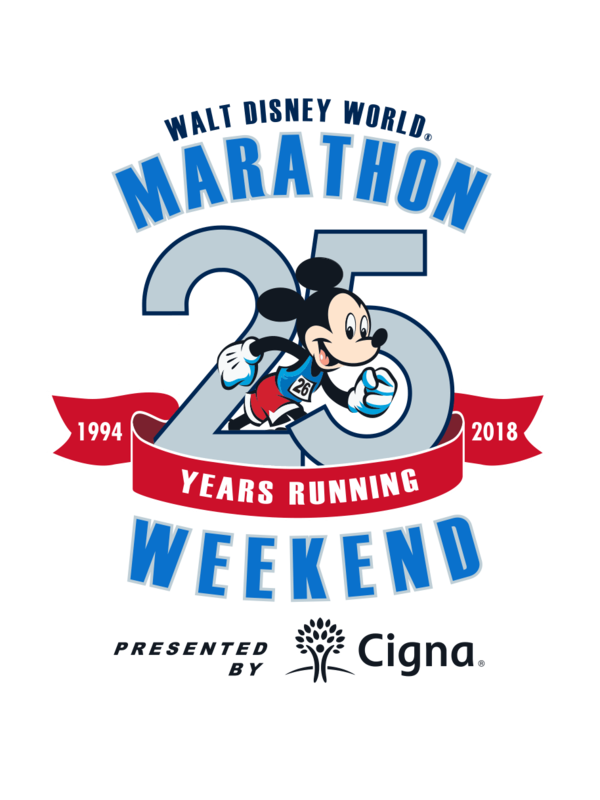 I can’t wait for my next opportunity to run in Disney World!